The University of Pretoria’s Mammal Research Institute (MRI) will celebrate its 50th anniversary by convening a four-day symposium aimed at setting the stage for the next 20 years of African mammal research activities in the face of ongoing socio-political, socio-economic and environmental changes. Adaptive responses to overcome or benefit from the anticipated challenges and opportunities provide a platform for future research under the umbrella of the MRI. We are inviting participants and speakers to use past and present experiences to assist with drafting of a blueprint to guide ongoing and new initiatives that will prepare graduates, scientists, policy makers and NGOs to cope with these anticipated challenges. The four-day event will be held at the Kruger National Park’s Mopani Rest Camp, from 12-16 September 2016, where invited speakers will present talks within one of three main themes, viz. (i) People and Wildlife, (ii) Environmental Stressors and (iii) Diseases at the Interface. In addition to these "theme-stream" presentations, we will incorporate “trigger talks” on topical, cross-cutting issues. Student participation and presentation is strongly encouraged. Poster presentations (incorporating a 2 minute presentation) will provide an additional platform to ensure that all aspects relevant to future mammal research are addressed. Abstract submissions are invited under each of the three main themes and in an “open” category. The organising committee looks forward to welcoming you to Mopani in September 2016 to celebrate this historic MRI milestone and to your contributions in mapping a path that will ensure the continued success of this flagship institute. 336 trees, 49 fish, 34 amphibians, 114 reptiles, 507 birds and 147 mammals. People's interaction with the lowveld environment over many centuries, - from bushman rock paintings to majestic archaeological sites, - is very evident in the park. 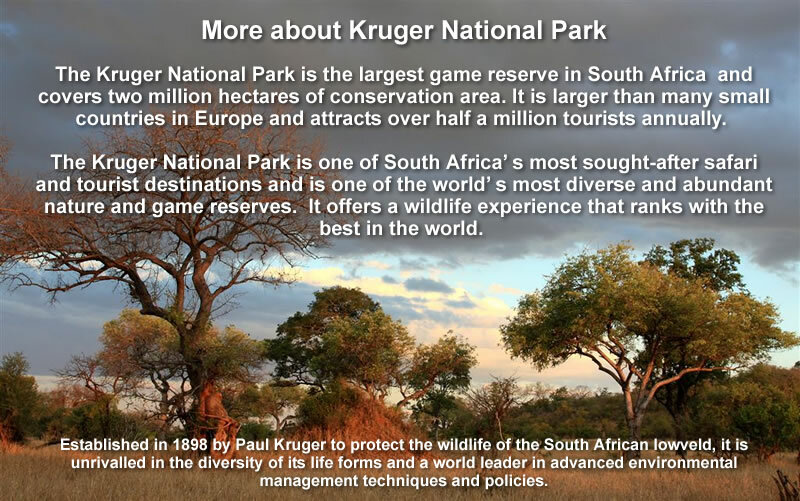 These treasures represent the cultures, persons and events that played a role in the history of the Kruger National Park and are conserved along with the park's natural assets.